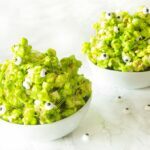 A quick and easy popcorn recipe that’s perfect for kids Halloween parties. It’s so much fun to make. This recipe is also great for popcorn balls too! I am deeply sorry I haven’t posted in a couple of months. Kinda embarrassing actually, but family first right? I’ve been so busy because we recently moved halfway across the map. More on that below but first, I can’t believe Halloween is almost here. This year has come and gone so fast! 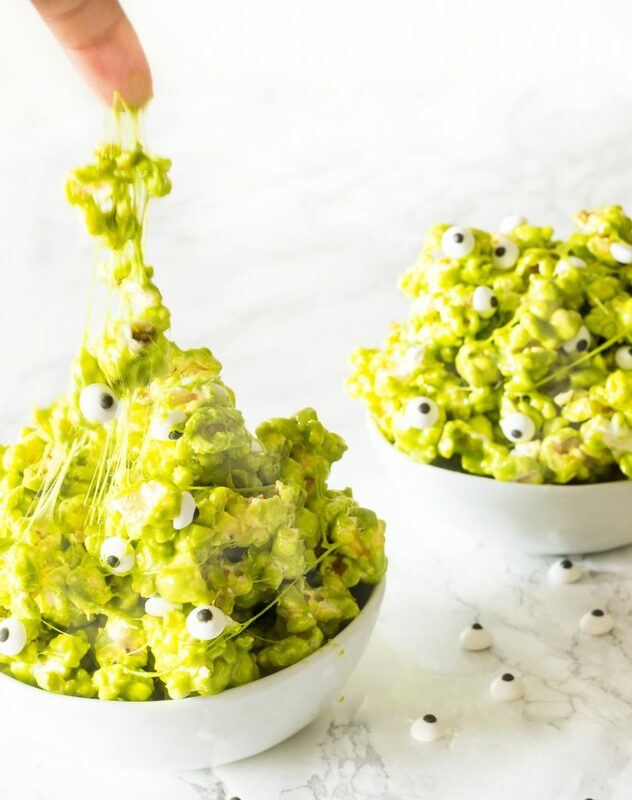 I am already seeing Halloween party stuff everywhere so I might as well share my fun slime popcorn recipe with you right? So anyway, This popcorn recipe comes from the Food Network Magazine. I knew I had to make it plus HELLOOO it’s popcorn, it’s green, has eyeballs and it stretches like slime. More on how to make it stretch in the notes of the recipe. What’s not to love? Kids will find this treat irresistible. My 5-year-old was supposed to help me make this, but he was more interested in eating the ingredients. I let him have his way a just a bit since we don’t allow him to eat a lot of sweets. Of course, he happily ate it once it was done. This Halloween, I can’t wait to make this popcorn treat for my kid’s class. Did I mention to you it’s their first day of school ever? Oh and that we finally moved from DC area to Kansas City now. It’s been a busy summer. I think, well it seems like my kids are finally adjusting to the move and everything. It’s been a HUGE challenge, to say the least. I’ve been a stay at home mom for 5 years and now my 2 little ones are FINALLY off to school. Yay! Now I can finally get back to blogging! I have great recipes I cannot wait to share with you. But first, let’s get to this popcorn recipe. Pop both bags of popcorn and pour it into a large wide bowl. Melt together the packed brown sugar and butter in a saucepan over medium heat, stirring often. Stir in 16 ounces of marshmallows until melted and smooth. Stir in drops of food coloring until color is evenly distributed. Pour mixture over popcorn and stir until evenly coated. Top with some or all of the candy eyeballs. Place the popcorn into a bowl. Or Ziploc bags if you are making them for your kid’s school. To make this recipe into popcorn balls, Grease your hands with vegetable shortening then form the popcorn into a ball right away before it’s cooled. Wrap each ball with plastic wrap and store at room temperature. 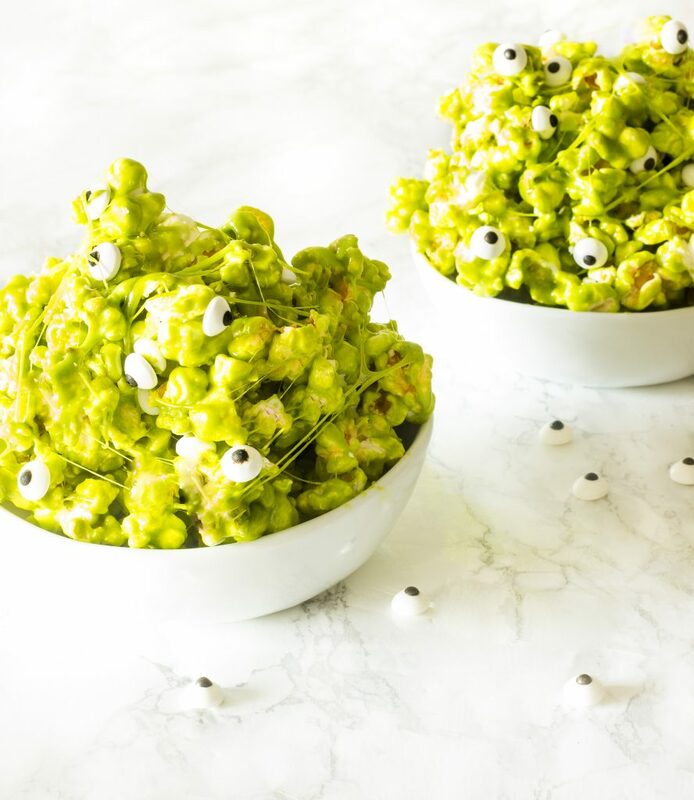 A quick and easy Halloween popcorn recipe called slime popcorn with candy eyeballs. It's so much fun to make. This recipe makes easy popcorn balls too. Parents, let your kid bring this Halloween popcorn to school! Pop both bags of popcorn and pour it into a large wide bowl. Melt together the packed brown sugar and butter in a saucepan over medium heat, stirring often. Stir in 16 ounces of marshmallows until melted and smooth. Stir in drops of food coloring until color is evenly distributed. Pour mixture over popcorn and stir until evenly coated. Top with some or all of the candy eyeballs. Place the popcorn into a bowl. Or Ziploc bags if you are making them for your kid's school. To make this recipe into popcorn balls, Grease your hands with vegetable shortening then form the popcorn into a ball right away before it's cooled. Wrap each ball with plastic wrap and store at room temperature. The popcorn will stretch right after it's done the cooking. It will not stretch cool. Store the slime popcorn in an airtight container. Eat within 3 days of storage. Thanks again for reading and subscribe to Whisk It Real Gud! If you are a food blogger, we would love for you to join our social networking group on Facebook. If you aren’t a food blogger, you can still join our recipe groups here and here. This looks so good and so fun to make! I’m not even a kid but I think my hubby and I would have tons of fun with this! 🙂 Can’t wait for Halloween! This is such a fun looking recipe. I wish I had kids young enough to make it for! May be I can borrow the neighbours’! My little sister will surely love this. One of her favorite colors is yellow-green. This is perfect for this coming Halloween, definitely adding this to our list. Thanks for sharing. What a neat, creative treat! Glad to hear you are settling well in Kansas! Well I hope you get some me-time after all the move and getting kids ready to go back to school. And these popcorn are so fun and perfect for Halloween. I might steal the idea for our neighborhood kids too! I need to make this with my nephew who is obsessed with slime! Cute and fun! My grandkids would totally LOVE this. I think I will print this off and tuck it away. What a fun party treat too. The love playing with slime, they for sure will love eating this. Oh my gosh this totally freaked me out at first, which is the idea right??? My kids will LOVE this, great idea!